The spirit of the scholar-athlete—those students who are equally achieving in academics and athletics—permeates D-E school culture. Our coaches, most of whom are academic faculty, help students become strong team players and effective leaders—both on the field and in the classroom. In this way, students develop character as much as physical skill. At Dwight-Englewood School, we teach the concept of good sportsmanship beginning in the Lower School, where young students develop gross motor skills and third-, fourth-, and fifth-graders enjoy co-ed intramural soccer, basketball, and baseball games. In the Middle School, in addition to a variety of sports, we introduce interscholastic competition. Physical education in the Upper School includes four years of coursework in lifetime fitness and two years of health. A full list of all athletic teams is available from the "Team Pages" link above. If an athlete suffers a trauma to the head, or a blow to the body, resulting in their exhibiting symptoms of concussion, then the athlete will be removed from the game/practice. The athlete will then be referred to a physician who is trained in concussion management, for authorization to either resume immediate participation or begin a "return to play" protocol. Questions may be directed to the Athletics Director at: schmic@d-e.org. NJSIAA steroid testing policy states that if an Upper School student athlete or students team qualifies for a state championship competition, the student may be subject to testing for banned substances. Click here for details. 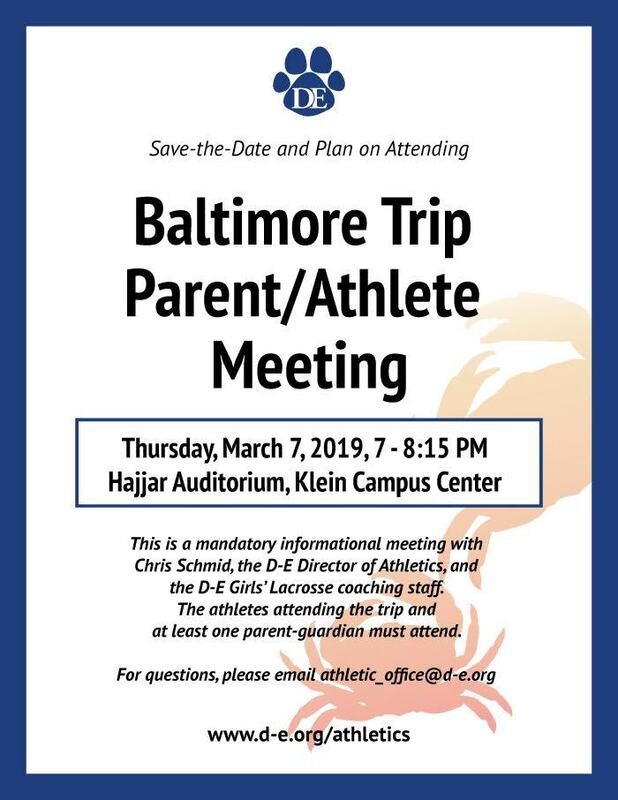 Questions may be directed to the Athletics Director at: schmic@d-e.org. Please read the following carefully. Everything included here is due by July 15, 2018. For physicals scheduled after July 15, see the first page in the packets to be printed out below. 2018-19 Medical Information (you will need physician contact and insurance information). PRINT OUT FROM LINK BELOW. ALL FORMS MUST HAVE REQUIRED PARENT AND/OR PHYSICIAN SIGNATURES. Please click below and print out to review and take to your physician. Springfield College - B.S and M.S. Coach Schmid has a Bachelor and Masters Degrees in Science from Springfield College and has been at Dwight-Englewood since 1977. As the Head Soccer Coach, he has led his teams to 2 state championships, 9 league championships, a county championship in 1991 and an overall record of 356-204-45. He has been inducted into the New Jersey Scholastic Coaches Association’s Hall of Fame (1998), the Dwight-Englewood Hall of Fame (1996) and the Bergen County Soccer Coaches Hall of Fame (2007). Fairleigh Dickinson University - M.S. Mr. Greibin Agramonte is the Associate Athletic Director. He has been with the D-E community since 2004. William Paterson University - B.S. Ms. Kimberly Conover is the Athletic Trainer. She has been with the D-E community since 2016.